Harvest operation south of Albion last Saturday. 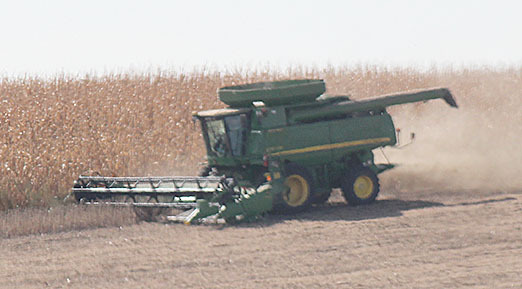 Many area farmers were wrapping up the soybean harvest this week and most were moving on to corn. Soybean harvest was estimated at 90 percent complete early this week in the Boone County area. Excellent soybean yields have been reported. One agronomist said soybean yields are averaging about 10 bushels better than last year. Some yield reports showed soybeans averaging 60 to 75 bushels per acre dryland and 70 to 82 bushels per acre irrigated in the area. Statewide, the soybean harvest was estimated at 62 percent complete, behind last year’s 73 percent and the 74 percent average. The statewide soybean crop condition was 20 percent excellent, 57 percent good and 19 percent fair. The Boone County area corn harvest was estimated at 20 to 25 percent complete by Tuesday, Oct. 18. Area corn yields were listed as highly variable, ranging from 150 to 200 bushels per acre for dryland and 200 to 270 bushels for irrigated corn. Some area fields were damaged by wind and other weather factors during the growing season. Details in the Oct. 19 Albion News Print and e-editions.